Situated on Wolf Creek, it's hard to believe this picturesque natural area is located within the city. Wesleyan provides a gathering spot for friends and family to meet and experience the outdoors just down the street. Beautiful woodlands, nature trails and vistas of the Wolf Creek surround picnic areas and playgrounds. A paved bike trail leads visitors to Adventure Central, where staff nurture families in life-changing activities that strengthen values, build lasting life skills and empower youth to explore life's possibilities with the aid of the natural world. Multiple free parking lots are available on site. From the north side of Wesleyan MetroPark, look out for herons foraging in Wolf Creek and recent signs of beaver activity. Popular scenic viewing spots include the pedestrian bridge over Wolf Creek and the paved trail beneath the railroad crossing. Head east on the Wolf Creek Trail and wind your way through historical West Dayton toward downtown. For 50 years, Five Rivers MetroParks has maintained healthy habitats. The restoration on the Wolf Creek shows how healthy water ways encourage thriving wildlife. Head to Wesleyan MetroPark and follow the path behind the annex and playground area. Hike the path to the gravel bar along Wolf Creek and see how many species you can spot. Wesleyan is the site of Adventure Central, an innovative partnership among MetroParks and Ohio State University Extension and 4-H Youth Development. Adventure Central is a dynamic, youth education center that offers exciting pro­grams during after-school hours and the summer, with an emphasis on nature and science. Youth are engaged in hands-on learning and receive assistance with homework, as they interact with staff and volunteers. There is ADA-accessible parking at both the main park and Adventure Central. The Adventure Central building is also accessible. On the trail spur that goes behind the Adventure Central building, the trail is accessible through the bridge. There is a water fountain located near the restrooms by the Pavilion shelter. Take Route 4 traveling northwest on James H McGee Boulevard. This route will take you directly past Wesleyan MetroPark. The park is accessible by foot or bicycle on the paved Wolf Creek Trail. View more info about the paved trails. Restrooms for both men and women are located near the Pavilion shelter. Wesleyan is the site of Adventure Central, an innovative partnership among the Ohio State University Extension, 4-H Youth Development and Five Rivers MetroParks. Here, urban youth learn about the environment and develop life skills through after-school programs, clubs and camps. There is also a nature center for programs on the ridge above the Wolf Creek. This inner city natural area contains mature floodplain forest, young upland forest and high-quality aquatic habitat in the Wolf Creek. The woodlands are managed by conservation staff for the control of honeysuckle and other invasive species. In 2009, MetroParks took on a significant bank restoration project on the Wolf Creek as it passes through the park. Funded by a grant from Clean Ohio, the project repaired severe erosion on the left bank at the bend in the creek, restored bank stability and improved fish habitat. Conservation efforts are also a part of the fabric of the Adventure Central program in the park, where youth help grow tree seedlings and get involved with other environmental stewardship activities across MetroParks. The south segment of the Wolf Creek Trail winds its way from Sunrise MetroPark through west Dayton and past Wesleyan MetroPark, ending at Little Richmond Road. A challenging road ride can be used to bridge the gap between this and the northwestern segment. Enjoy good river fishing in the Wolf Creek. The creek supports a variety of fish including spotfin shiners, smallmouth bass, largemouth bass and rainbow, green, fantail and Johnny darters. An Ohio fishing license is required. Many times visitors never make the short walk from the picnic shelter to the Wolf Creek, where great blue and green herons, mallards and kingfishers along with robins and cardinals can be in easy view. Beaver activity can be spotted along with crayfish and crayfish chimneys. A wade in the creek may bring an up-close look at carp, smallmouth bass or stonerollers. Along the bank is a beautiful area to see prairie wildflowers in bloom. The park features large cottonwoods and sycamores, among other native trees. Enjoy more than 1.5 miles of hiking and walking trails through natural areas on both sides of Wolf Creek. This inner city natural area contains mature floodplain forest, young upland forest and high-quality aquatic habitat in Wolf Creek. Wolf Creek supports a variety of wildlife and offers scenic views as it flows through Wesleyan MetroPark. Both great blue herons and green herons have been spotted foraging in the creeks, and trees show recent signs of beaver activity. The creek also supports a variety of fish. Popular scenic viewing spots include the pedestrian bridge over Wolf Creek, the paved pathway beneath the railroad crossing and the gravel bar along the creek reached from the hiking trail on the west side of the creek. Spend time looking for aquatic life in the cool waters. Watch as birds feed along the banks. Come back often to discover the seasonal beauty of this remarkable area. Wesleyan features both a traditional play area and a nature play area for children. Kids can move back and forth between the playground and the nature play, which has logs and areas for kids to find bugs and explore habitat. The nearby pavilion offers restrooms and a shady spot for lunch. Walk or bike into the park off of Wesleyan Road. Parking is available at the entrance on the corner of Wesleyan Road and West Riverview Avenue. It’s a short walk to the play areas on easy paths. Follow the trail behind the nature center down to the creek to discover horn corals, fossils and tiny river creatures. If you enjoy working with school-aged youth, a wide variety of opportunities are available at Adventure Central. Whether your interest is leading a hike, working with youth on computers, helping with homework or assisting with reading, there is something for everyone. Building relationships with caring adults is an important part of the youth experience at Adventure Central and volunteers play a crucial role. Both long-term and episodic volunteers are needed. Call (937) 278-2601 for more information. Cross-country ski the picnic areas, open meadows and paved trails. Hiking trails are open all winter long in most MetroParks. 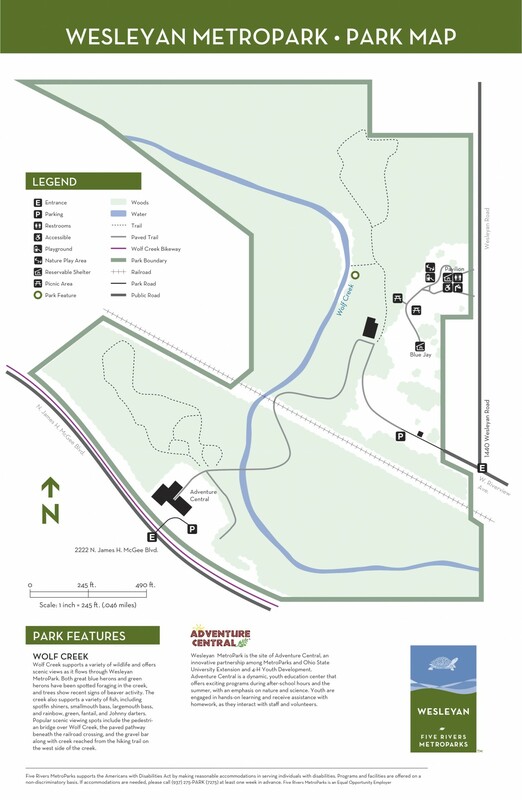 Situated on Wolf Creek, this 62-acre natural area is located within Dayton city limits. Beautiful woods, scenic Wolf Creek and wildlife make this park especially appealing.